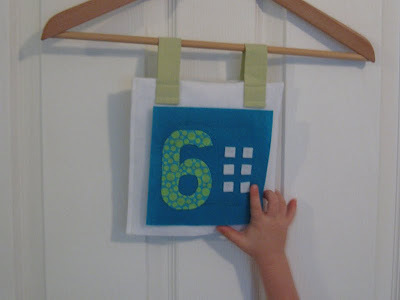 I've started a new little game around our house called "The Number of the Day" to help my 3 year old learn his numbers. He has all his letters down and almost all the sounds associated with them. And he can just about count to 30, but he has a really hard time differentiating between the numbers themselves. It's like that particular code is a lot more difficult for his little brain than the letters. 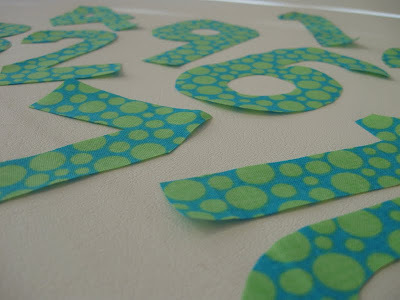 To help him with this I started the Number of the Day. Each morning he comes out to the living room to see a new number from 1 to 10 drawn on his art easel. Next to the digit is a group of dots he can count to figure out what the number is. And all day we look for the special number wherever we go: at the store, on toys, in books, in recipes, etc. I thought it might be helpful to have a little something in the car since we are on the go a lot. 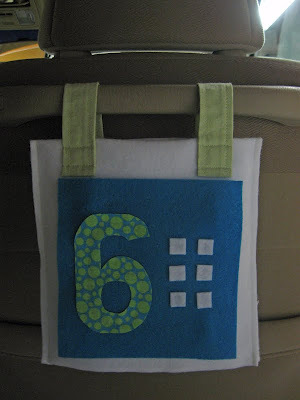 So I came up with this little on-the-go Number of the Day craft. The idea is that it hooks onto a handle on the seat in front of your little learner (if such a handle exists in your car). Figuring my little one may not be the only one needing help with his numbers, I took photos as I went for a tutorial (finished dimensions are 8" square + hanging loops). 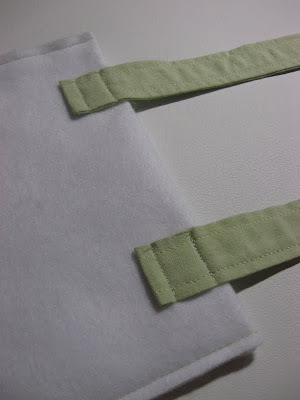 There are a lot more steps than I realized but it's a simple project and requires very little sewing. Enjoy! 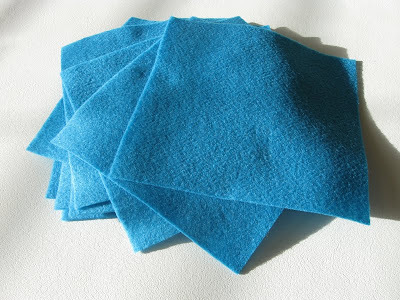 Cut 1 piece of felt measuring 8" x 24"
Cut 55 small squares of felt - I made 1/2" squares. 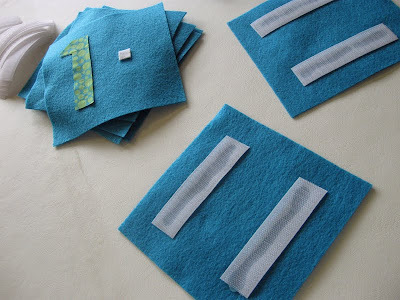 This sounds like a lot of work, but it's really easy and quick with felt and a rotary cutter. Circles would be even cuter, but more time consuming. You could also use buttons if you want to spend a little cash and pick out super cute ones. 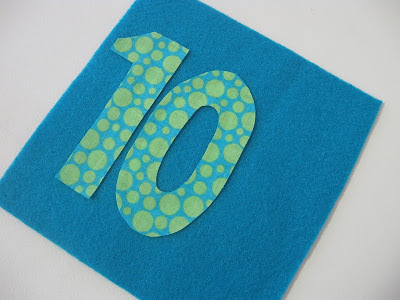 Cut out your numbers 1 through 10 in felt or fabric. I made each about 4" x 2 1/2". 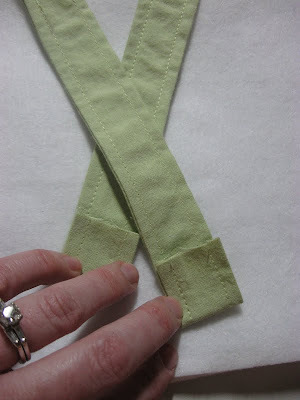 Make 2 straps measuring 8" long, or cut 2 lengths of ribbon. around the handle in front of your little one). 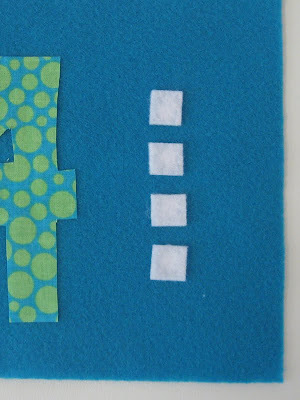 Glue your numbers to the 6" squares, offset to the left, using Tacky Glue. on the ride side according to number. 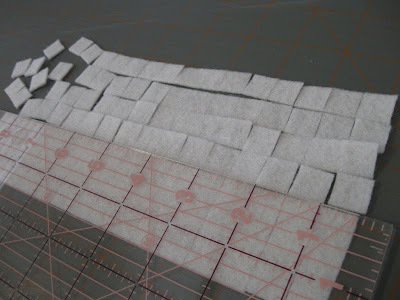 rather than putting glue on the tiny squares. 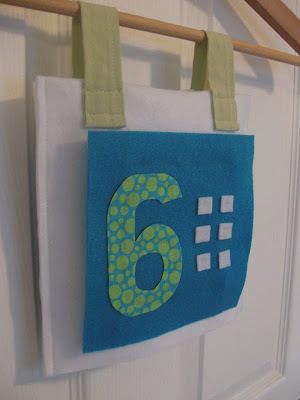 Now put your velcro strips on the backs of your 6" squares. If you are smart enough to get self-adhesive velcro, you are smarter than me. 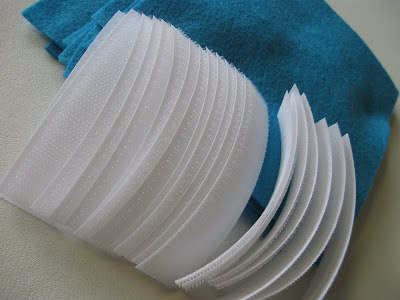 But, if you have plain ol' velcro, a hot glue gun works wonders to stick these on. 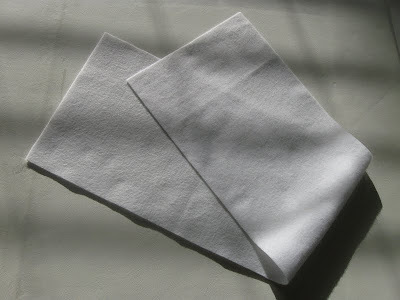 Now your squares are done! Time to move onto the number "board." about 1" in from either side. 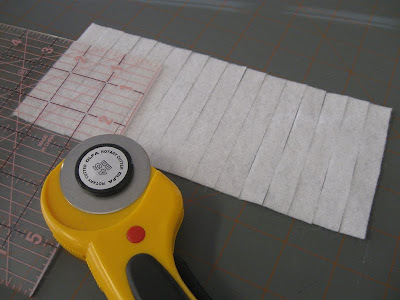 Pin & sew up the open sides to form a double-layer front and a pocket in the back. 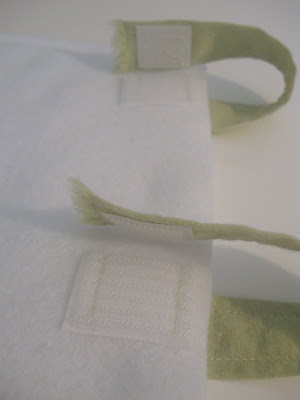 and secure it with a cute button to the back of the "board" (this was my original plan). and two small pieces of loop to the back of the board. 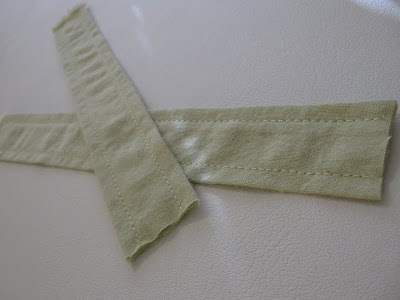 You'll notice I even used the selvage edge for the ends so I didn't have to hem them! 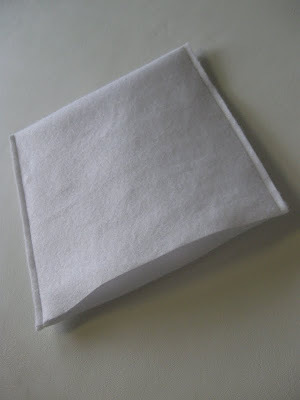 Now stuff your 6" squares into the pocket and you're ready to go! 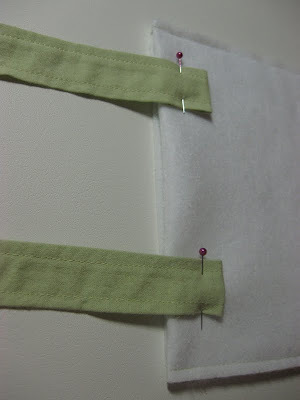 I found that stacking them velcro sides together kept them from snagging on the "board." I put 4 pairs stacked this way in the pocket, our number of the day on the front, and 1 more square stuck to the back. Now step back and admire how cute (and educational!) 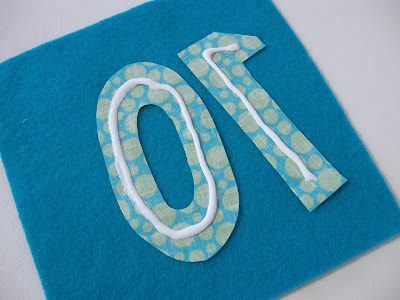 your on-the-go Number of the Day craft is! What a great idea. Stephan and I were just talking about how Reagan needs to work on her numbers! 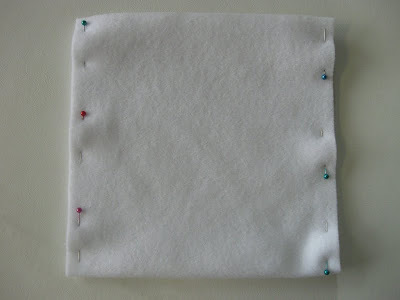 I may start making this on paper as I have limited time for sewing these days. Great project. OMYGOSH!!! I love this idea and one of the cutest things I have seen in a long time.......so inventive. 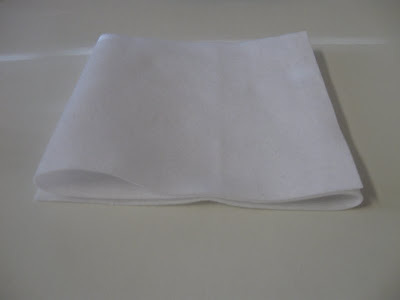 Can I try to post it to craftgossip.com? Oh, thanks so much! 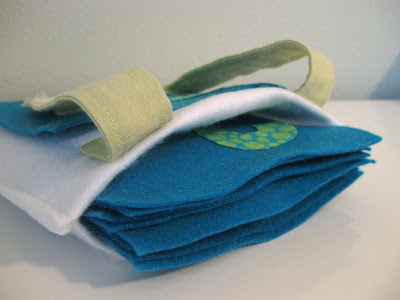 And you are more than welcome to post it to craftgossip - I would really appreciate it! Your comment made my day. :) Hope you had a good one.